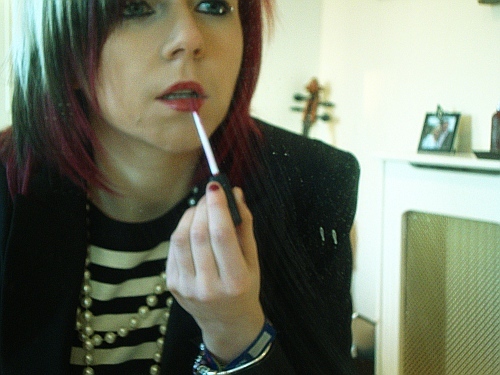 girlnextdoorfashion: running, food, lifestyle, lipstick: New hair, new year, new me!! New hair, new year, new me!! Yesterday I found out some news that.. well if I’m honest, I didn’t want to hear. And after a few hours of rejection and crying I’ve decided that I have a lot of things to leave in 2009- and that includes boys!! Turns out I have another thing to give up this year!! 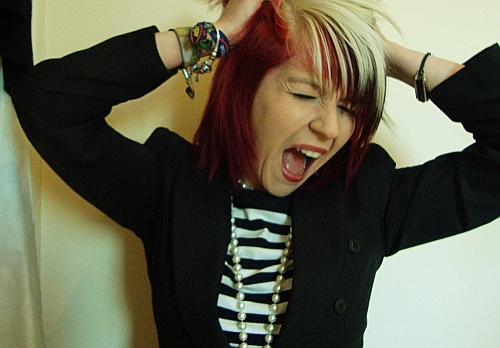 So I got my hair done yesterday, with a bit of nervousness I must admit. My hairdresser has broken her ankle and I have been panicking the last week about the length of my usually shoulder length hair and my fringe that has become so long I think my eye thinks I’m going blind!! I finally managed to book an appointment and found that it was the lady who runs the salon who was going to cutting and colouring my hair- slightly less fear!! I’m always nervous about getting a new hairdresser. I mean my hairdresser Becky knows me, we can have a chat (usually about my disastrous love life!!) and she knows what suits my face shape and how I like it. But at the same time, I’ve had my hair the same colours since I was 16 and I’ve had a pretty similar cut the past couple of year, so I decided that having someone new might be a bit exciting!! Well, I love it! !She’s put some red in my normally blonde/pink/black hair, added a black chunk at the back, and made my blonde much more vibrant. The cut is choppy and layered and I love it!! I wanted to wear my new TopShop heart print tights that arrived yesterday, but they demanded lots of pale, girly neutral and right now my hair is so bright and choppy it just wouldn’t have worked!! So I’ve gone for my favourite striped top (which is my Mum’s!! 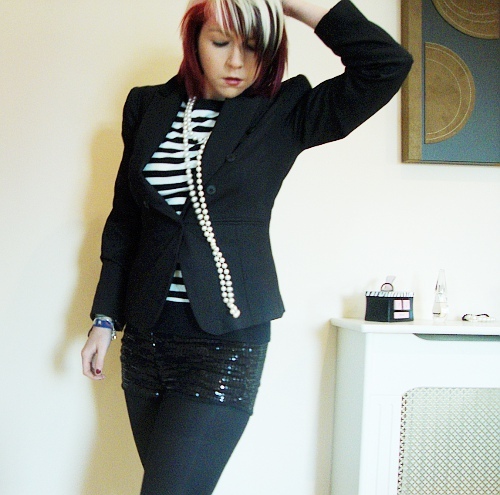 let’s hope she doesn’t notice if it takes a wander back to Birmingham with me on Saturday…), the sequin TopShop shorts I got from ebay for my housemates Glam Rock birthday and my mum’s Matalan gorgeous double breasted blazer. 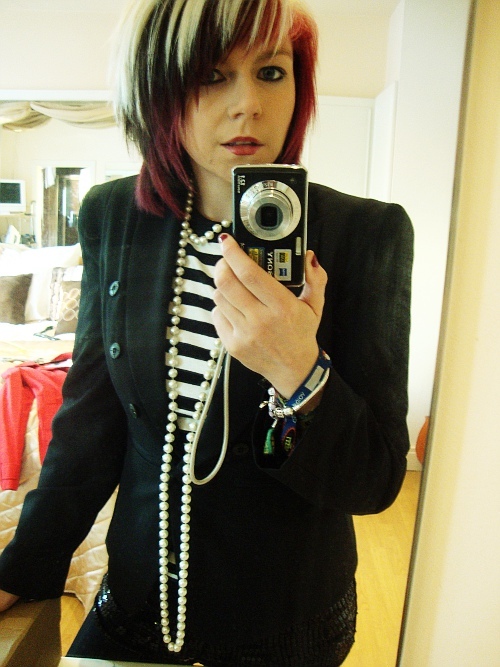 I absolutely adores blazers, and all mine are uni are my Mum’s suit jackets she doesn’t wear any more. I hope when I’m older I can be a professional like my mum and wear suits all day!! Later: Right, essay done just the book to get on with now, but I found some time to take some photos!! My photography skills still majorly need work but I'm sure it'll improve in time. Any other fashion bloggers out there have any advice? 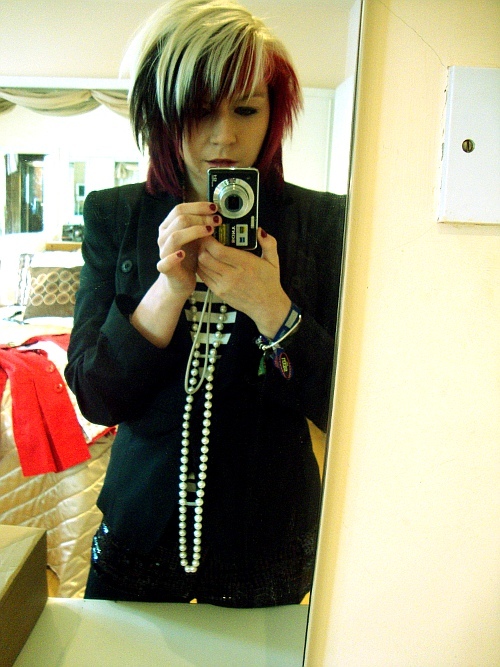 So we have a few photos of my outfit, and a few amateurish photo-in-mirror pictures of my hair!! Rightio, back to post modern literature now!! Please let me know what you think- I'm feeling a little unloved comment wise!! I have another post planned that will be up in the next few days, and my new River Island leather studded blazer and studded pumps arrived today so expect some outfits including those the next few days!! This is probably going to be one of my last posts before I go back to uni, where life is a mess of deadlines, reading and restricted by my tiny bedroom but I'm hoping my blog won't suffer too much!! I also can't wait to get photoshop back!! I was quite the PS wizz in my youth but I've not had a copy of it for ages- I'm so sick of GIMP!! I can't wait for my wonderful housemate Emily to lend me her disc- yay! !